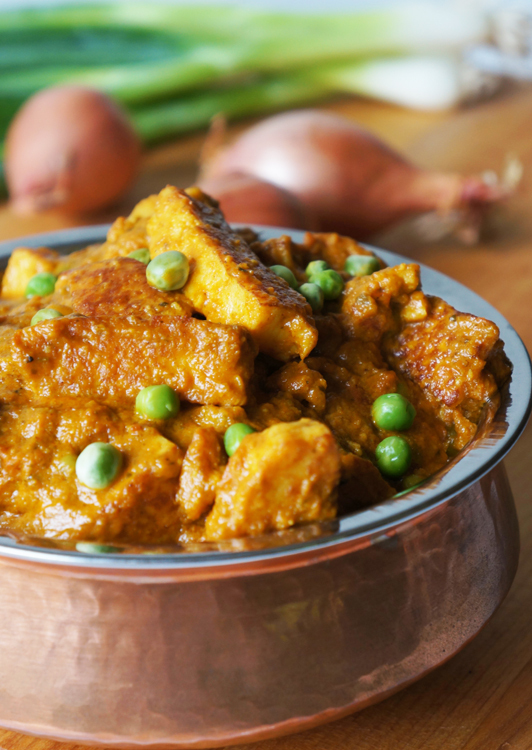 Mattar Paneer Curry is a North Indian dish made with paneer and peas. The sauce is spicy, creamy and slightly sweet. Mattar Paneer is a dish I make frequently when I entertain, especially when my guests are vegetarian. To keep the paneer soft and moist, fry the pieces until they turn light brown, remove with a slotted spoon, and put them directly into warm water. Just before they go into the curry, gently dab them with paper towels, to remove as much water as possible. I think this recipe comes pretty close the popular Indian restaurant versions. I hope you will try it and give me your feedback. You can buy paneer and kasoori methi at Indian grocery stores. Grind chopped onion, ginger, garlic, and cilantro in a blender. Set aside. Cut the paneer into small pieces. I cut my paneer into small rectangular pieces. In a non-stick frying pan, over medium heat, add one tablespoon of oil and then add a few pieces of paneer at a time and fry until light brown. Remove and put them directly into warm water. Repeat with the rest of the oil and paneer. Set aside. Heat three tablespoons of oil in a large saucepan over medium-high heat. When the oil shimmers add cumin seeds. When they splutter add the ground onion, ginger, garlic, and cilantro. Sauté until it turns light brown and begins to stick to the bottom of the pan. Add the tomatoes, scrape the bottom of the pan well, and fry until the oil separates. Add the coriander, chilli, turmeric and cumin powder. Sauté for one minute and then add the peas. Add water, cover and cook until the peas are done. In the mean time, drain the paneer pieces and with paper towels gently remove excess water. Add the paneer to the curry. Crush kasoori methi in the palm of your hand and add it to the curry. Add cream and lemon juice. Stir gently and cook for five minutes. Serve mattar paneer with rice, chapatis or naan.